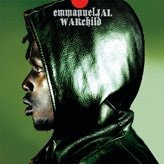 Emmanuel Jal, child-soldier of Sudan turned Hip-Hop artist, has incorporated his experiences into "Warchild," due out May 13, 2008. The inspirations for the 13 songs on Warchild are rooted in Jal's impossible past. In "Forced to Sin," Jal recounts, "I lived with an AK-47/By my side/Slept with one eye open wide / Run / Duck / Play dead." His love and loyalty for his homeland of Sudan shines in "Stronger" - "I pledge allegiance/To My Motherland/That I'll do everything possible/To make a stand/Yes I can." Jal pleads with rapper 50 Cent on "50 Cent" to be a better role model for his young fans: "You have done enough damage selling crack cocaine/now you got a kill a black man video game/We have lost a whole generation through this lifestyle/now you want to put it in the game for a little child to play..."
Jal plans to support the release of Warchild with a tour of North America; details will be announced shortly. In addition, he frequently speaks on college campus about his experiences in an effort to raise awareness of and halt the inhumane treatment of children in Sudan. "I believe I've survived for a reason," says Jal in Warchild. "To tell my story, to touch lives."